The former site of three different Little Chefs, at the northern end of the Hailsham Bypass. The newest (Hellingly) Little Chef, closed. The roundabout was built in the 1950s. At the position of the service area was an RAC service centre, possibly taking advantage of a short stub of road which had been provided in case New North Street would ever become a dual carriageway. The petrol station was a Total, and is now operated by Shell. 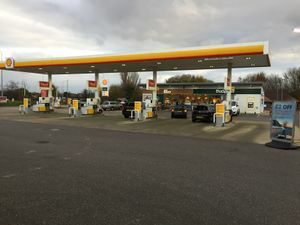 In 2018, the store was rebranded from Shell’s own Select to Budgens. The former tourist information centre is now the contact centre for a builders firm. Little Chef have managed to occupy three buildings on this very short section of road. First, the Lower Dicker branch opened in around 1974 after taking over Bill's Transport Cafe. In the 1980s, their rivals Happy Eater acquired The Country Fox/The Old Orchard restaurant, slightly further up at Golden Cross. By 1987, Forte owned both brands and they and Action 2000 started looking at building a new service area at the Boship Roundabout. This opened in around 1990 as a large Happy Eater and Travelodge, next to a petrol station and tourist information centre. 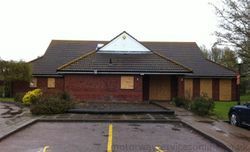 At the same time, Little Chef moved into the old Happy Eater at Golden Cross (known as the Hailsham branch), and the old Little Chef closed and was replaced with houses. In 1996 all Happy Eaters became Little Chefs, so the one at Boship became the Hellingly branch. Its large building gained a Burger King and the two restaurants competed until 2000 when the oldest one closed, to become a car centre. The newest Little Chef then closed in 2012. A Greggs store joined the Starbucks cafe in 2018.